Many common rock-forming minerals contain hydrogen and when rocks containing hydrogen-bearing minerals are subjected to increasing temperature or decreasing pressure, water can be released. Release of water from hydrated minerals occurs when magma flows upwards, when magma heats surrounding rocks or when tectonic uplift brings rocks to a region of lower hydrostatic pressure. At the elevated temperatures and pressures found at depth in the earth, silica is highly water-soluble. It is common for hot, pressurized water emanating from deep sources to leach silica from the rocks through which it travels on the way toward the surface. Silica is practically insoluble in water at the ambient pressure and temperature of the earth's surface. When silica-laden water cools as it approaches the surface, silica is precipitated, often forming quartz veins in rocks. Hot, pressurized silica solution is highly mobile and is capable of travelling through narrow openings and dispersing widely over planes of weakness such as joints or shear fractures. The presence of intruding, pressurized fluid constitutes an effective tensile stress and can widen or propagate joints. Because quartz is of low solubility in rain or groundwater and is hard and cohesive, it is more resistant to erosion than many other rocks. Quartz is also not subject to crystal grain realignment by directed tectonic compressional stress or shear stress. Quartz veins can provide a means of observing planes of weakness as they existed when the hydrothermal activity producing the quartz veins originally occurred. Quartz veins cannot be dated absolutely using the conventional methods of geochronology. 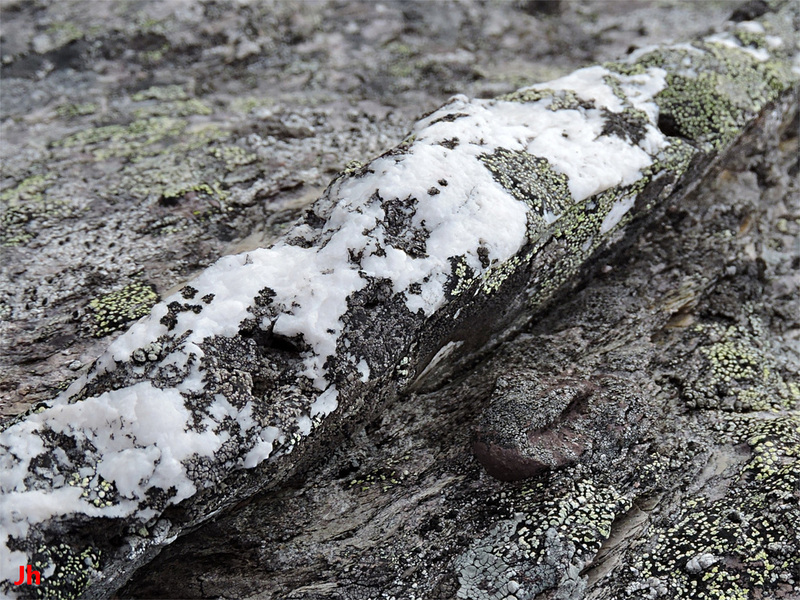 Quartz veins are easy to spot in the field because of their usual strong color contrast with surrounding rocks (there are some exceptions) and because lichen does not readily colonize (hence conceal) quartz surfaces. The quartz veins shown above occur in fine-grained alluvial sedimentary rock. 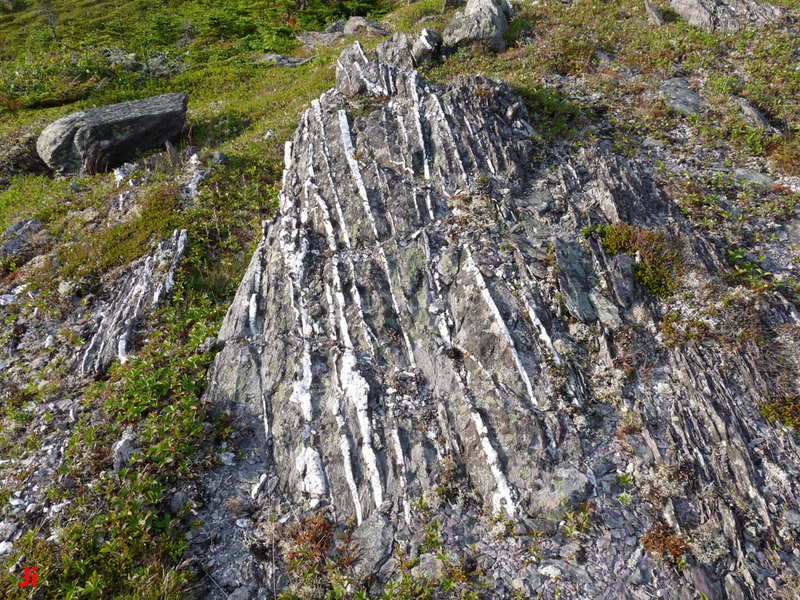 The rock is rich in phyllosilicates and has developed cleavage from compressional tectonic stress as can be seen most clearly at the lower right of the photo. The strike of the cleavage is aligned with the north-east trend of the Dover Hermitage Bay fault and the dip is near vertical. The quartz veins appear to follow the strike and dip of the surrounding rock. These veins are thus post tectonic and much younger in age than the Ediacaran rock they intrude. 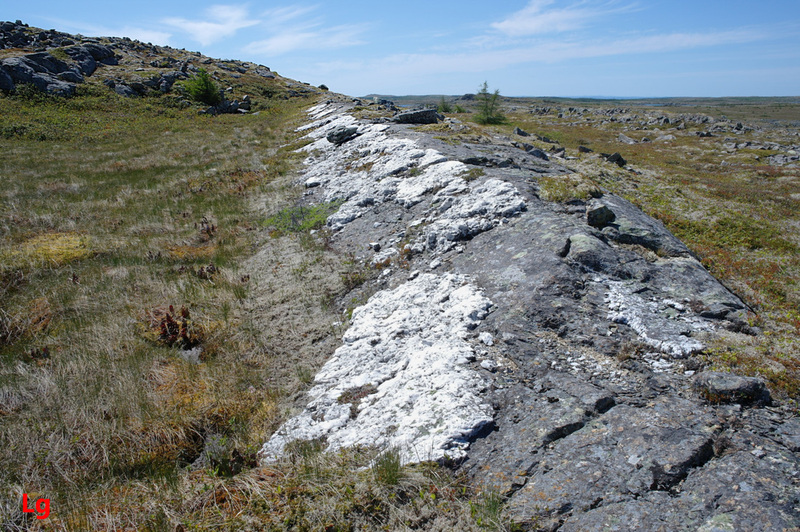 This quartz vein, more than 1 m thick in places and exposed over a vertical distance of 13 m (as shown above), occurs in volcanic rock with a high phyllosilicate content. 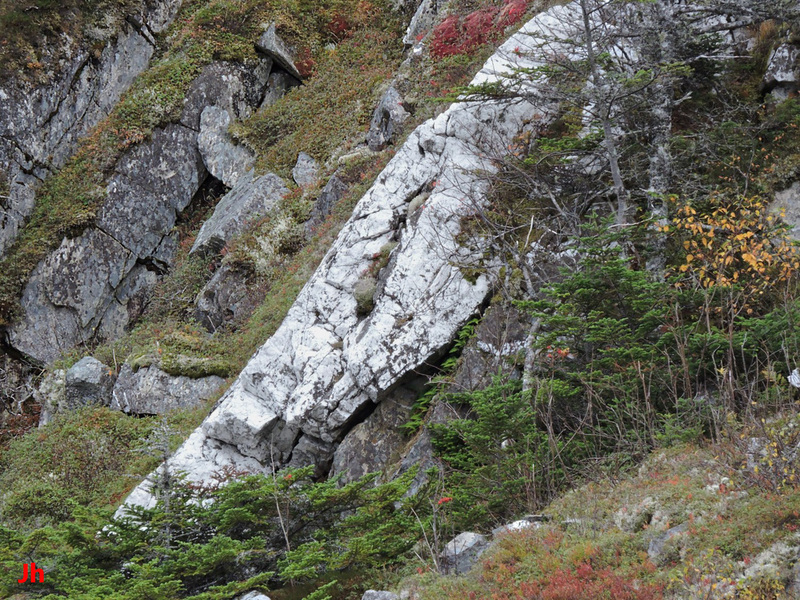 Glacial erosion has stripped away the rock on the side of the vein facing the camera. 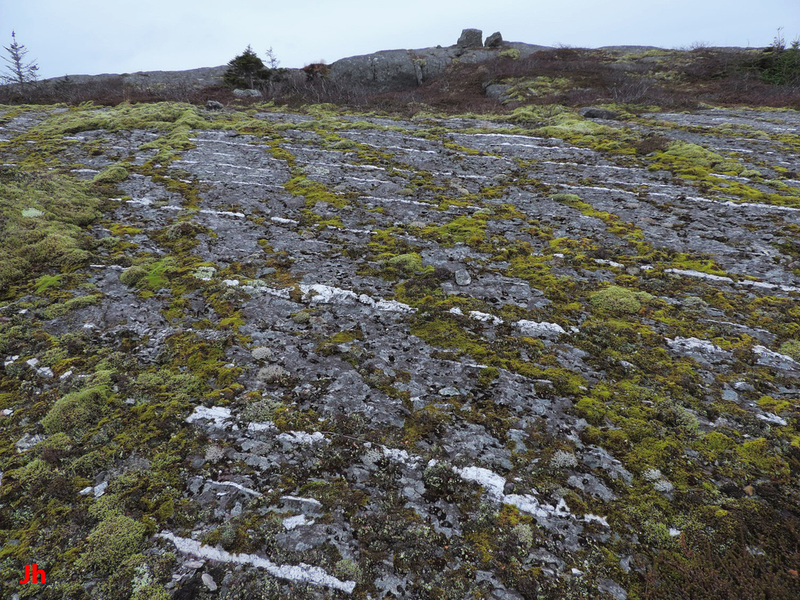 This feature appears to be connected to another large quartz outcrop 380 m to the south-west and may be part of a quartz-vein system extending several kilometers in length. The illustrated quartz vein strikes 26 degrees E of N, following the general trend of the D-H fault, and dips at 45 degrees. An edge-on view of the quartz vein is shown right. In the background are rocks from the hill in which the quartz outcrop is set. Eroded surfaces following joints in the host rock are visible and show the same strike and dip as the quartz vein itself. This implies that the quartz has intruded along a previously existing plane of weakness in the volcanic rock. The photos below show the contact of the vein with the underlying rock. Cleavage is evident in the underlying rock and the contact surface against the quartz is aligned with the cleavage. The two pictures below illustrate details of the host rock in which the quartz vein is set. The rock pictured on the left (boulder 60 cm wide) is etched by erosion to reveal distinct cleavage in the volcanic rock. A freshly broken surface (specimen 10 cm wide) is shown on the right. 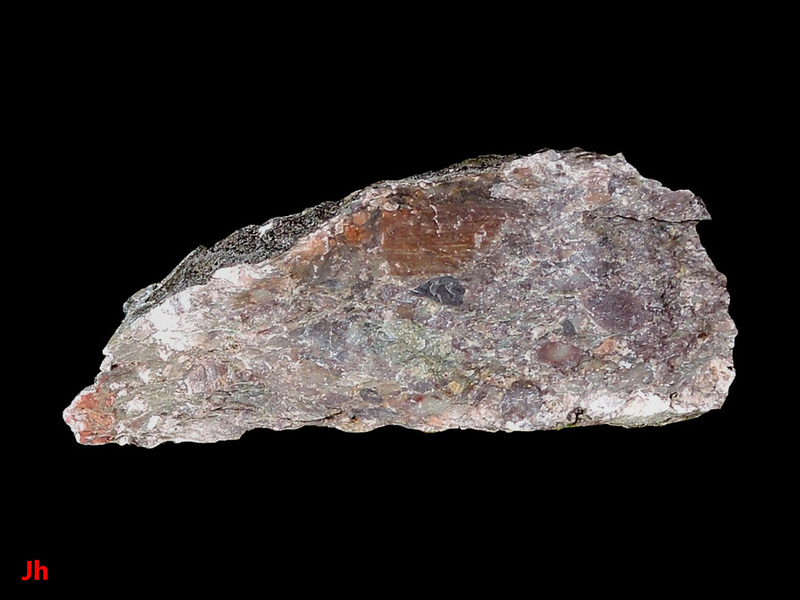 The colored clasts in the rock suggest it is a tuff or an ignimbrite, but the matrix is a phyllite with a platy texture. The rocks hosting the quartz have apparently undergone metasomatism, converting volcanic minerals to phyllosilicates. The rock was then additionally metamorphosed by compressional tectonic stress to align platy crystal grains perpendicular to the stress direction. 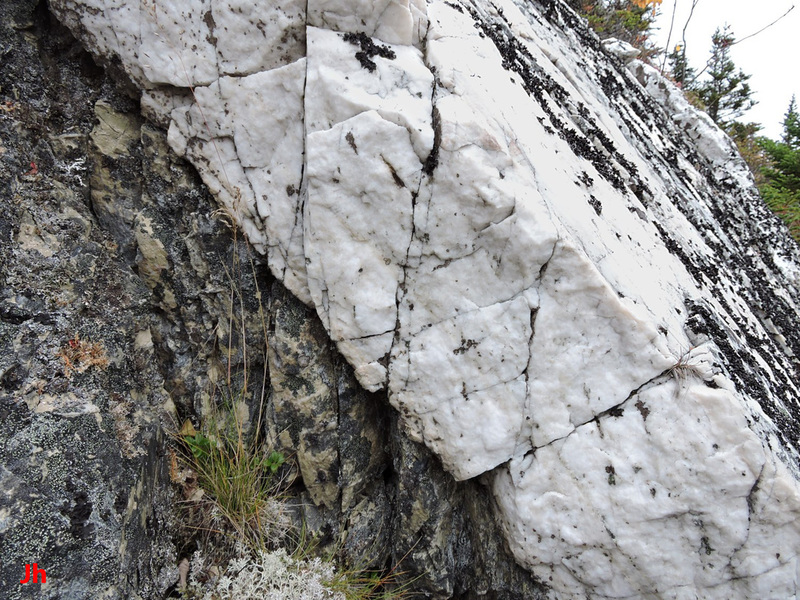 After the rock had developed cleavage, hydrothermal silica solution flowed into a joint along a cleavage plane, eventually widening the joint enough to allow development of a thick quartz vein. 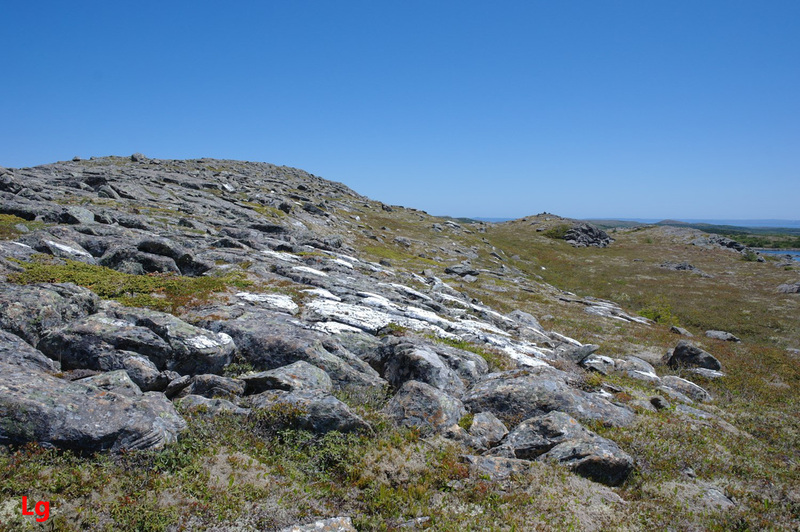 The quartz outcrop seen below lies 380 m from the somewhat larger and more northerly outcrop described above. A line joining the two outcrops is directed 17 deg. E of N. The strike of the quartz vein shown below is 17 deg. E of N and the vein dips at 48 deg. Although the rock between the two outcrops is either missing or the quartz is concealed, it is likely that the two quartz outcrops both belong to a single large vein following one continuous plane of weakness in the host volcanic rock. The quartz vein pictured above is about 30 cm thick and extends about 6 m high. 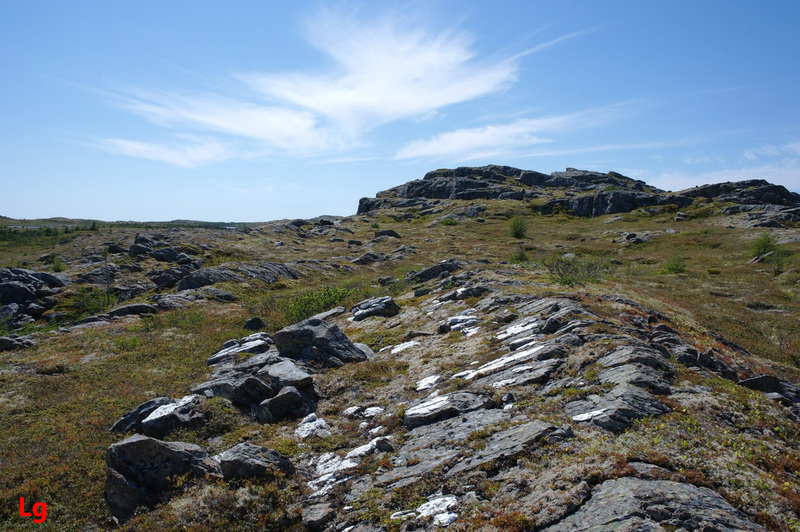 The visible surface was exposed by glacial erosion after removal of a large body of rock. A detail of the edge of the vein showing contact with the underlying rock is provided below. Cleavage is evident in the rock underlying the quartz vein as can be seen above. 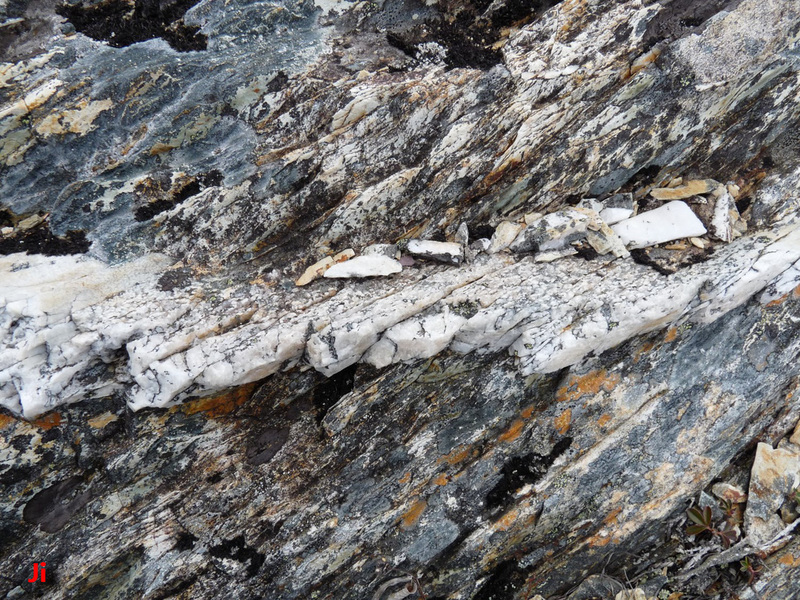 Unlike the more northerly associated outcrop described previously, the cleavage in this instance does not match the dip of the quartz, although the strike still appears to match. This suggests that the original cleavage guiding the dip of the quartz vein was subsequently overprinted by different cleavage after the quartz was in place. The timing of emplacement of the quartz would be restricted by this assumption. The quartz vein would need to have formed sometime during the interval when active tectonic compression of the host rocks was still occurring. 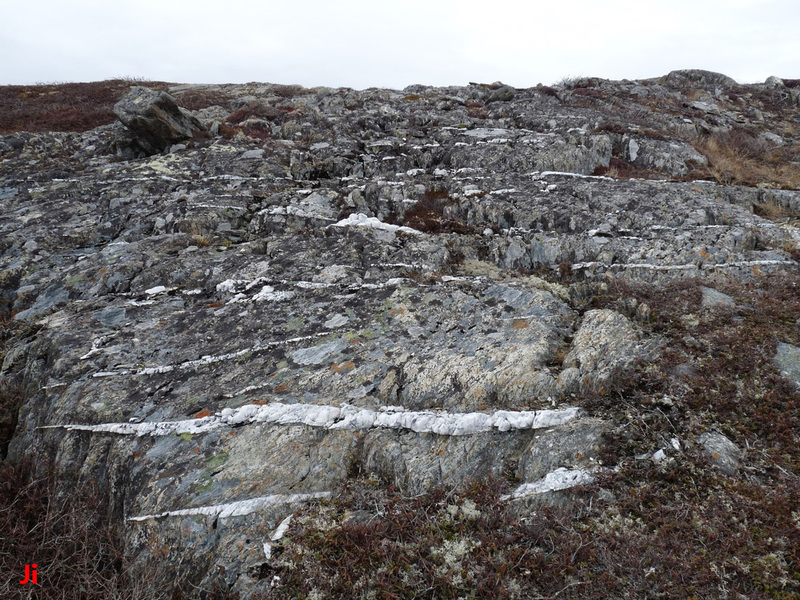 The quartz veins shown above lie 4.5 km northeast of the two large quartz outcrops described previously and may form part of the same quartz-vein system. The straight line joining the locations of the two occurrences is directed 13 deg. E of N and the veins shown here strike at 20 deg. E of N. The host rocks are volcanic, tuff or ignimbrite, but show strong cleavage indicating metasomatism and crystal grain alignment by compressional tectonic stress. The strike of the cleavage and associated jointing and failure surfaces in the host rock closely matches the strike of the quartz veins. The right photo is a closeup of one of the veins shown in the left photo, and is included to better illustrate the dip. 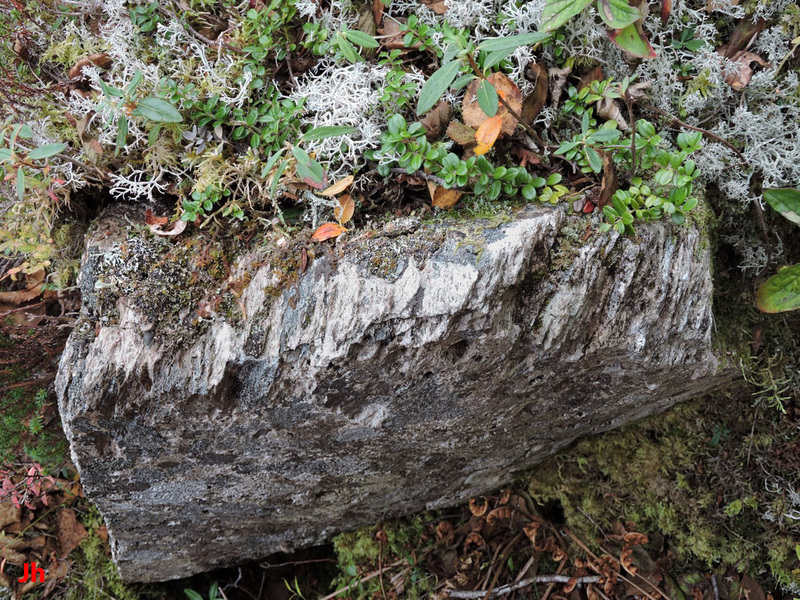 Because of a slower rate of erosion by rainfall and lichen, the quartz protrudes above the adjacent rock by about 2 cm. It can be noted that at the end of the last glacial period (about 10,000 years ago at this location) the quartz would have been scraped flush with the surrounding rock by moving ice. The 2 cm protrusion is the result of 10,000 years of differential erosion. The dip of the quartz veins is approximately 70 degrees, directed 70 degrees W of N. The dip of the cleavage in the host rock is approximately 60 degrees, directed 110 degrees E of N. Accordingly, the angle between the quartz-vein dip and the dip of the cleavage in the host rock is about 50 degrees. Since the quartz veins run parallel to one another and their strike matches the strike of tectonic cleavage and joints in the surrounding rock, it is probable that the veins developed along cleavage of tectonic origin. 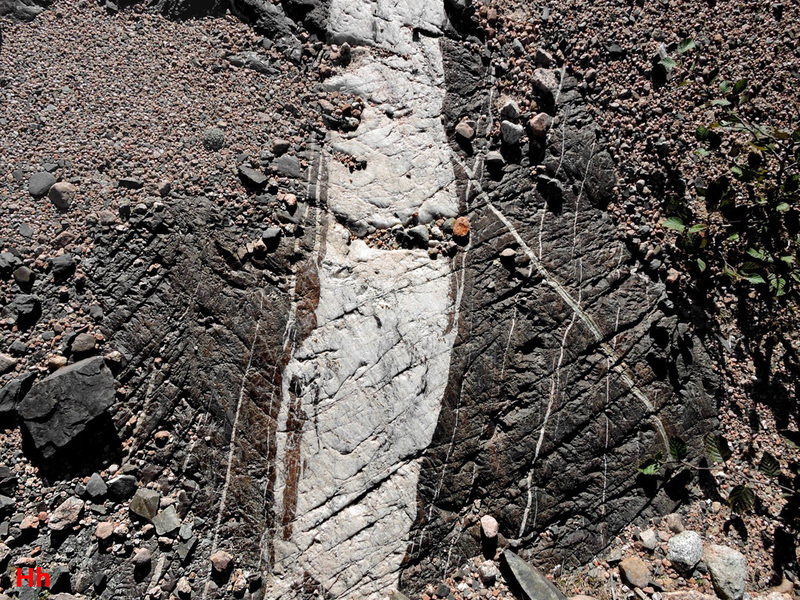 This original tectonic cleavage was overprinted with new tectonic cleavage with the dip eventually shifting 50 degrees from the original dip angle. Given that the shift in cleavage alignment occurred during the Acadian orogeny, the quartz veins were likewise formed during the Acadian orogeny. The set of parallel quartz veins appearing in the above photo occurs in ignimbrite. The veins strike 17 deg. E of N, and are aligned closely with the tectonic cleavage/jointing trend in rocks neighboring the above-pictured outcrop. 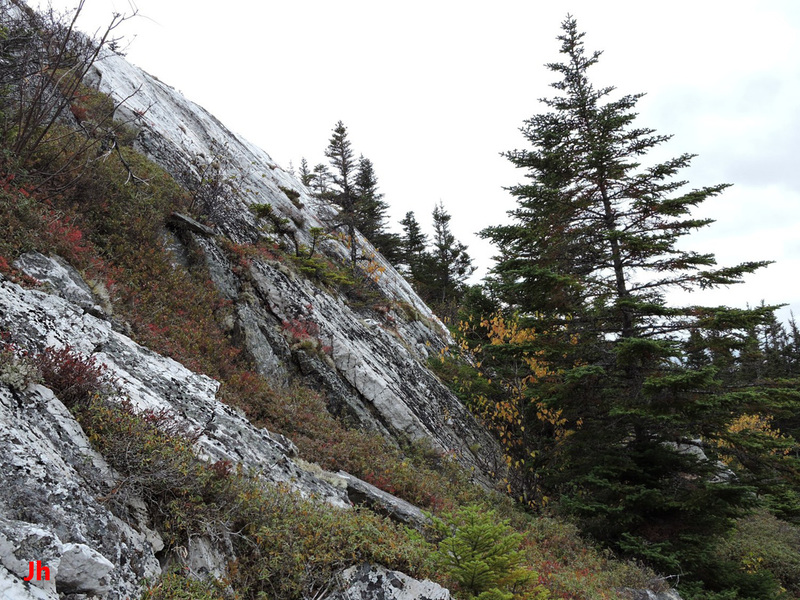 In the particular outcrop seen above, however, the dip of the cleavage in the ignimbrite appears to be nearly 0 degrees, while the quartz veins dip steeply. The quartz does not protrude significantly above the host rock at this location and it was correspondingly difficult to measure the dip of the veins. Following a discussion similar to that presented above, it is probable that these quartz veins date from the Acadian Orogeny and that they developed in a joint set that was subsequently overprinted. 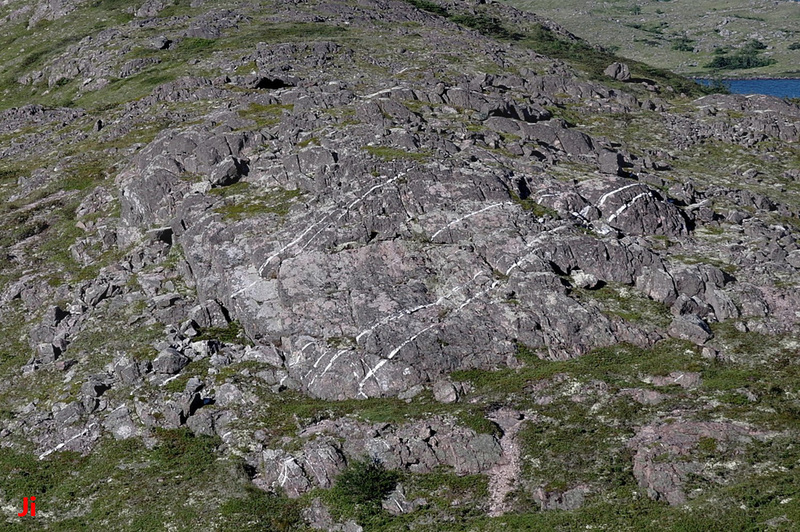 The quartz veins appearing above (width of foreground view about 15 m) are notable because they seem to follow an indistinct tectonic cross joint set rather than the prominent longitudinal cleavage. The cleavage, jointing and etched surfaces plainly visible in this outcrop strike in a direction following the general trend of the D-H fault. 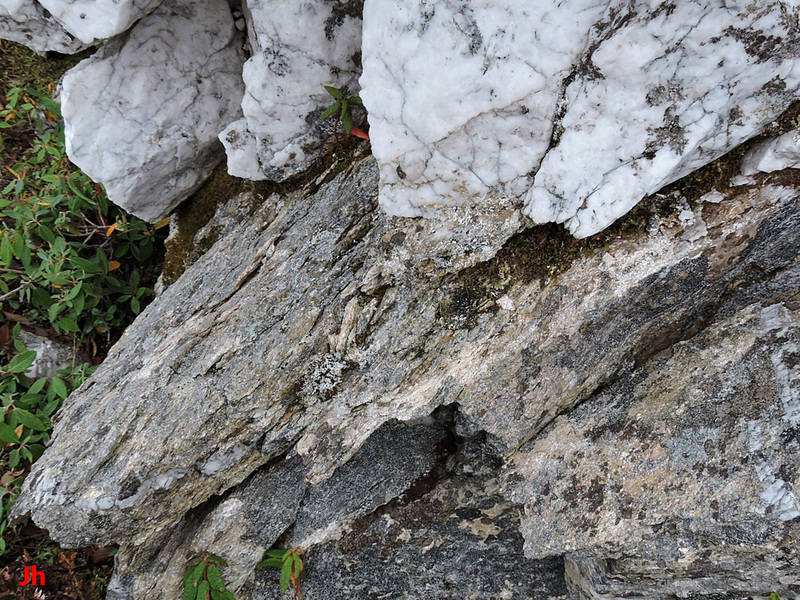 Examination of the rocks seen in the foreground (front center of the photo) reveals that smaller quartz veins, likely from the same hydrothermal event, also appear along the longitudinal cleavage. This points towards their probable post-tectonic origin. If the larger veins occur in a cross-joint set, this joint set was subsequently diminished or eliminated as a significant plane of weakness since present-day erosion surfaces no longer clearly indicate its presence. This 20 cm wide quartz vein and associated thin parallel veins occur in metamorphosed basalt or andesite immediately adjacent to a large granite pluton (the Ackley granite). 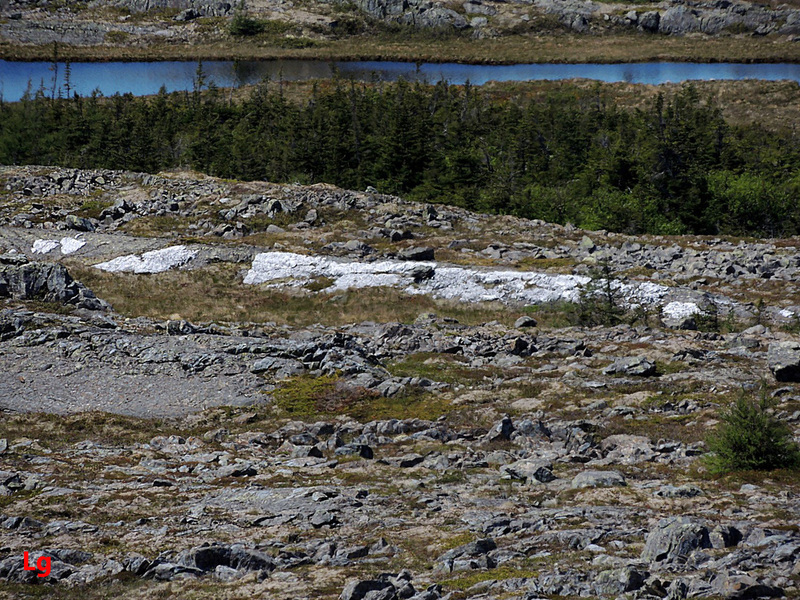 The ground surface shown is horizontal and glacially polished. The veins strike at 33 deg. E of N, indicating probable association with tectonic compressional planes of weakness. The present-day cleavage indicated by the etching of the surface is complex, suggesting at least two near-orthogonal strike directions, neither aligned with the quartz veins. Furthermore, joints appear to cross the thick quartz vein, clearly indicating that these joints formed after the vein was in place. Since quartz is not subject to crystal grain alignment by compressional stress, the joints seen in the quartz are likely shear fractures. 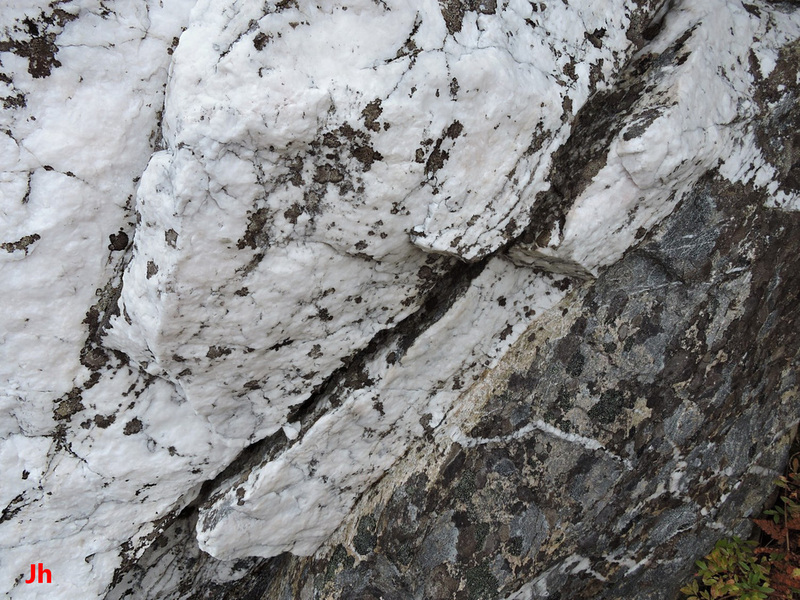 The shear stress in this rock would have originated during emplacement of the pluton, accompanied by elevated temperatures and associated metamorphism. These conditions would account for the overprinting of the origiunal tectonic cleavage, now revealed only by the quartz veins. Neither the strike nor the dip of these quartz veins (photo at right is detail from photo at left) correspond with the distinct tectonic cleavage present in the alluvial sedimentary host rock. Instead, the quartz veins themselves show internal jointing parallel to the tectonic cleavage (right photo). This set of quartz veins might follow a pre-tectonic joint set. Alternatively, the veins might have arisen from pre-tectonic hydrothermal activity with enough pressure to fracture rock lacking pre-existing planes of weakness. In either case, the quartz veins would predate the Acadian orogeny. The aligned joints in the quartz indicate that the compressional tectonic stress responsible for phyllosilicate crystal grain alignment (hence cleavage) in the host rock also included a component of shear stress. The four pictures above all show alluvial sedimentary rock in an area with complex multiple planes of weakness. 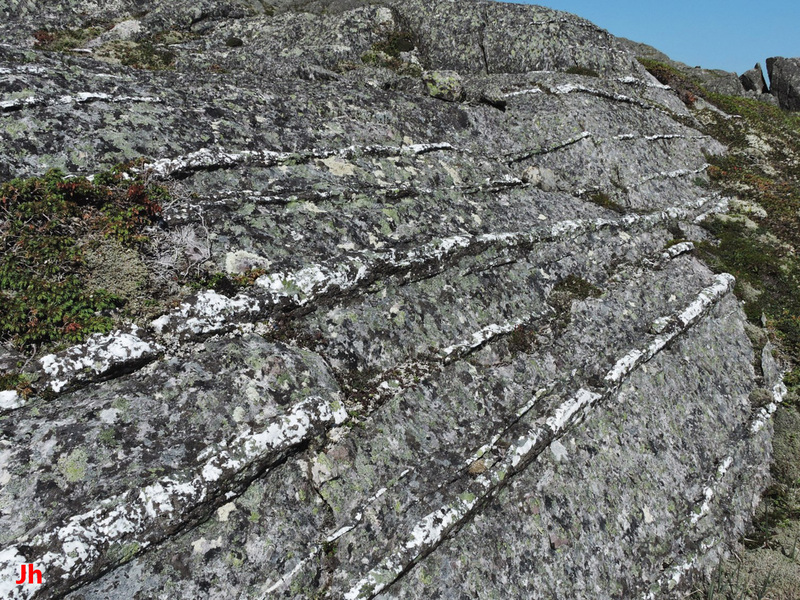 Many of the joint sets, cleavages and failure surfaces seen in this region appear to line up with the usual directions expected when Acadian tectonic stress is the source of the planes of weakness. In other cases, the rock has developed joints or flat, ice-eroded surfaces that parallel bedding planes. However, in some cases it is not clear how the planes of weakness might have originated because their strike or dip seems arbitrary. It is always possible that glacial ice could coincidentally erode a flat plane of rock bearing no relation to any underlying weaknesses in the rock. Quartz veins such as seen above help exclude this possibility in some cases. In each of the four instances pictured above, ice flow has removed rock to expose the remains of a quartz vein. The surface underlying the quartz vein has a strike and dip that are clearly not just an artifact of ice flow. The strike and dip values can be noted and correlated with other features in the area where quartz is not present. 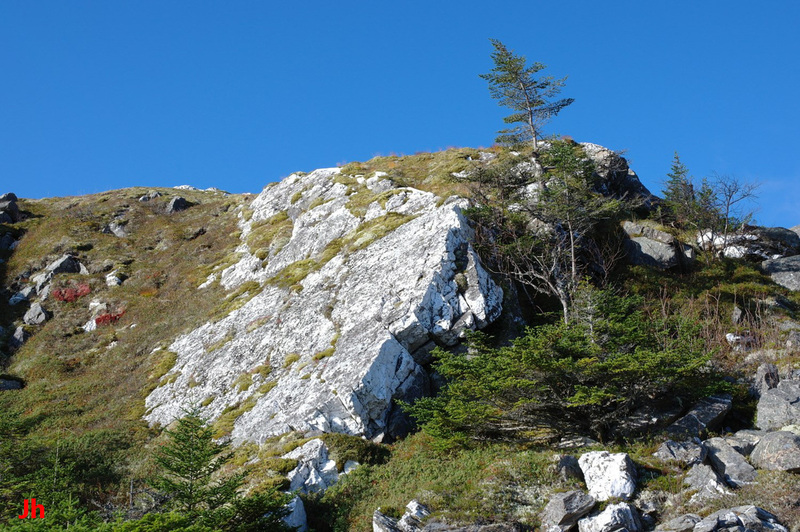 In this way, joint sets formed in tectonic events predating the Acadian orogeny might be identified.